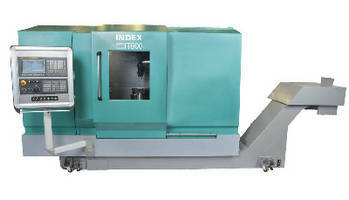 With extra B-axis in upper tool carrier that can pivot 100Â°, TRAUB TNL18-7B Sliding/Fixed Headstock Lathe can machine highly complex parts and complicated contour elements that also require additional operations such as milling or drilling, at any angular position. Tool turret indexing is carried out by NC rotary axis without mechanical lock, permitting free angle positioning of turret. TRAUB TX8i-s control allows alternate programming, optimization, and simulation in interactive or NC mode. 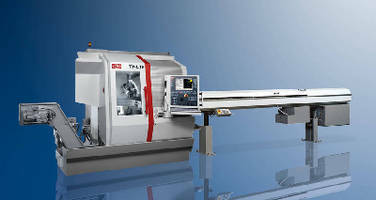 The TRAUB TNL18 sliding/fixed headstock automatic lathe with seven linear axes now is available with an extra B-axis, expanding its applicability to particularly challenging machining tasks. 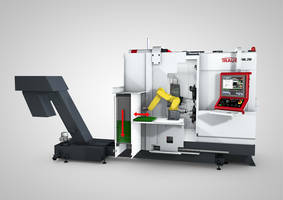 With the additional B-axis in the upper tool carrier, which can pivot 100°, highly complex parts and complicated contour elements that also require additional operations such as milling, drilling, lateral drilling or l threading may be machined at any angular position by the new TNL18-7B. Previously, for parallel main spindle operations, angled tool holders were necessary with "normal" turret positioning - now the turret simply pivots. In addition, the 8-position turret with the double driven tool holder per position capability provides additional flexibility. o Set-up time reduction: Setting up angle-adjustable tool holders is no longer necessary. o Cost reduction: No need for using expensive angle-adjustable tool holders. o Higher workpiece quality: The omission of angle-adjustable tool holders creates more stable machining conditions in the machine system. o Complexity gains: Due to additional operations in any angle positions, highly complex workpieces can be produced more flexibly and efficiently in a single setup. o Carried out by an NC rotary axis without a mechanical lock. This permits free angle positioning of the turret. o All turret stations can be equipped with fixed or live tool holders. o The number of tools in the machine can be increased to as many as 54 tool stations through dual- and multi-tool holders. o Clear advantage: There is less setup effort for the operator, resulting in more productive time. 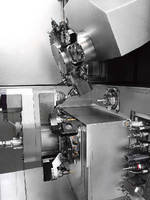 o High-precision, fast turret indexing enables a very fast chip-to-chip time of 0.3 s, which is closely comparable to that of a linear tool carrier. The new TNL18-7B also comes with the new TRAUB compact shank system: an improved system for high-precision mounting of tool holders in the turret. Tool holders are seated deeper in the turret, which results in less leverage effect and, thus, higher stiffness. For live tool holders, the large shank diameter enables insertion of roller bearings with large diameters. A quick-change system permits a high-precision and fast tool change without removing the tool holder. The compact shank system increases tool life and also contributes to improved surface quality. It takes just a few steps to convert the TRAUB lathe from sliding headstock to fixed headstock turning mode and vice versa. The extremely long Z-travel distance of the headstock ensures proper positioning of the main spindle, either for sliding headstock turning or fixed headstock turning. The powerful main spindle is equipped with a C-axis as standard and it delivers high torque in order to achieve large cutting volumes. The vertical machine bed design results not only in a favorable chip flow but also an extremely compact footprint. This is also made possible by integrating the control cabinet in the upper part of the machine, enabling space-saving integration of the automatic lathe into existing machine groups or cells. The working area is easily accessed by the operator through its remarkably high and wide sliding door. This provides a lot of room for setup and changeover activities. 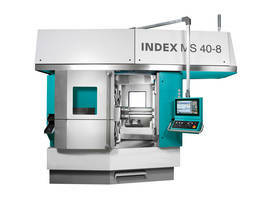 A generously dimensioned inspection window allows the operator to keep a close eye on the machining process. Another plus: For servicing, the back cover is quickly removed to allow full access to the mechanical assemblies. The hydraulic and pneumatic components are also arranged with full accessibility to the rear of the machine and can be easily checked at a glance. The TNL18-7-B is equipped with the TRAUB TX8i-s control, which is based on the CNC control from a worldwide leading control manufacturer, while the user interface software is TRAUB-specific. o seamless support because the machine, control and drives are from a single source.